part of the PACSAT software not directly associated with spacecraft management and control. 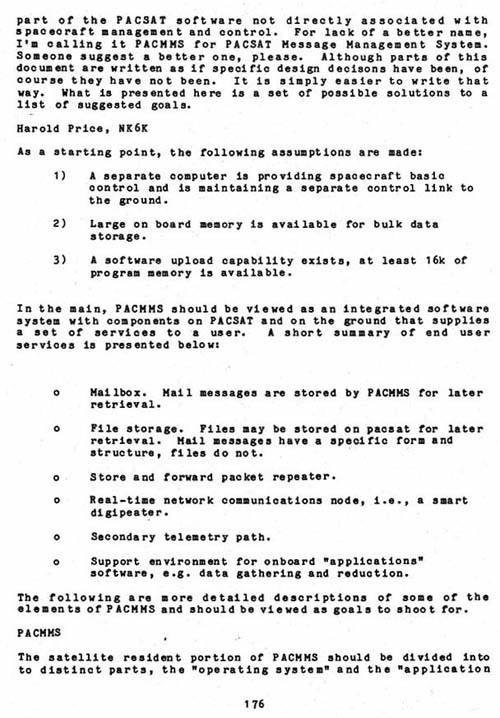 For lack of a better name, I'm calling it PACMMS for PACSAT Message Management System. Someone suggest a better one, please. Although parts of this document are written as if specific design decisions have been, of course they have not been. It is simply easier to write that way. What is presented here is a set of possible solutions to a list of suggested goals. 1) A separate computer is providing spacecraft basic control and is maintaining a separate control link to the ground. 2)	Large on board memory is available for bulk data storage. 3) A software upload capability exists, at least 16k of program memory is available. o Mailbox. Mail messages are stored by PACMMS for later retrieval. o File storage. Files may be stored on paosat for later retrieval. Mail messages have a specific form and structure, files do not. o Store and forward packet repeater. o Real-time network communications node, i.e., a smart digipeater. o Support environment for onboard "applications" software, e.g. data gathering and reduction. The following are more detailed descriptions of some of the elements of PACMMS and should be viewed as goals to shoot for.